To book-lovers and collectors who have been searching for months, years, decades, lifetimes: Welcome! Explore our catalog of treasures! The excitement of collecting can be yours. Consider upgrading your present library with more valuable editions. 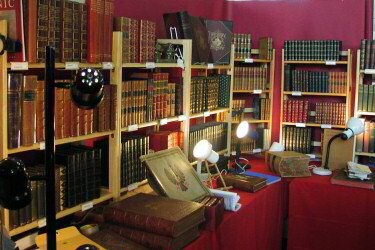 We specialize in developing libraries of leather-bound sets of classic English, American and continental authors, along with first editions of literary value. We also feature Desk Items: Inkwells, Bookends, Lighting, and Art. We are eager to assist you in creating a library filled with literary treasures for immediate pleasure and long-term investment. Special requests or searches are welcome. In his long career in higher education that began in 1956, numerous European residences, and as a writer and professor, Dr. Sheppard Kominars has been intimately involved with the world of books. The libraries he has created for clients stimulate creativity and imagination.